Saturday- We left at 6:35 driving southeast on AR 173 to Hwy 201 and into Maine. We stopped at about 9:45 in Jackman, where we were originally going to pick up Bob’s medication. We mailed a letter at the post office, went next door to a deli and used the facilities, then continued on our way. We arrived in Waterville at about 11 AM. We went straight to the UPS facility, which looked closed. The sign even said that they were closed, but Bob was able to go right in and pick up the package. We left and went to a gas station and filled up, $2.16 gal. Then we went to Walmart. We picked up a few groceries. There was a Supercuts in the parking lot, so I ran in. I waited about 7 minutes and then had my hair cut. I had not wanted to try to do that in Quebec, as my French was better than the gals English in Quebec! While I was there, I asked where was a good place to get a Lobster Roll. One of the ladies said in Oakland, one exit south on I-95 at the Corner Store. We went there. Wow, was she right! Each one was $12.50, but oh so good! The best we have ever had. I so was busy eating I forgot to take a picture! A lot of lobster and a freshly baked roll. Awesome! We followed the GPS across country and finally turned north onto Hwy 201. This is the Old Canada Road, which is very scenic, running along the Kennebec River. We had no problems going through customs/immigration at the border. We arrived back at the MH at a little after 5 PM. In Maine the weather had been sunny and in the 70’s, now it was cloudy, low 60’s, and very windy! Sunday- Moving day! We packed up and left the KOA around 10AM. We drove down the road about a mile and pulled into a wide area to hook up the car. Then we turned northeast on AR 20, driving from exit 311 to exit 337. We turned west and went to Hwy. 132 where we turned northeast, running parallel to AR 20. 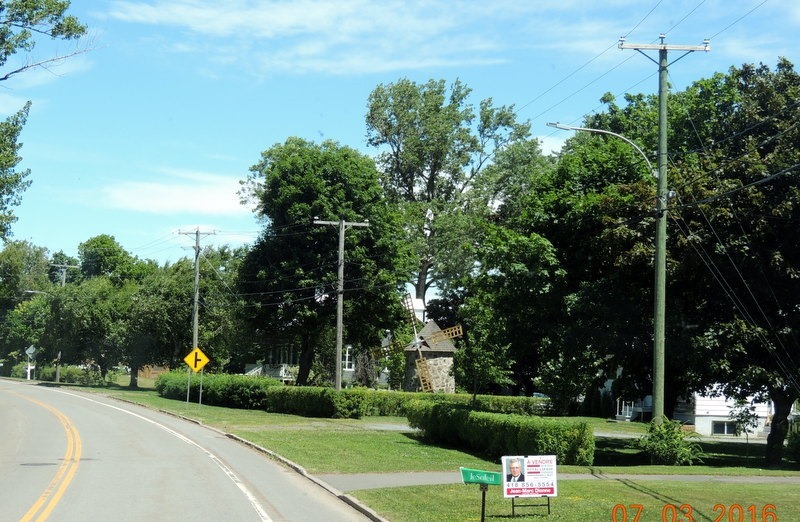 This was a two lane road, along the St. Lawrence River, with stunning views between the houses and the trees. 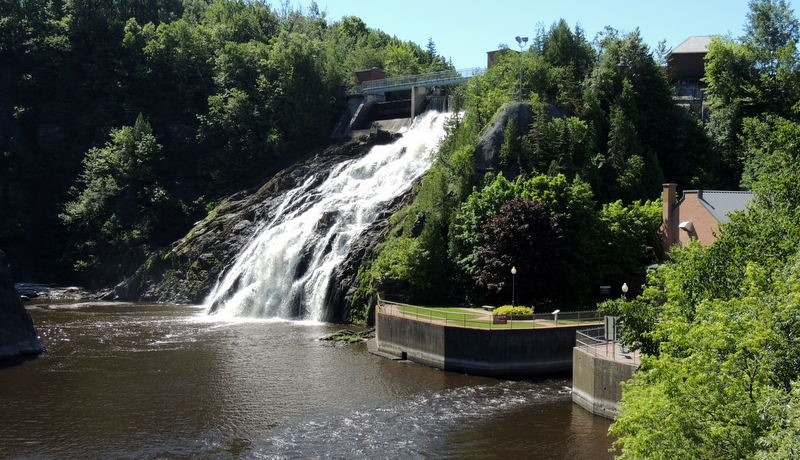 Once we left Quebec City region, we entered the Chaudiere-Appalaches region. 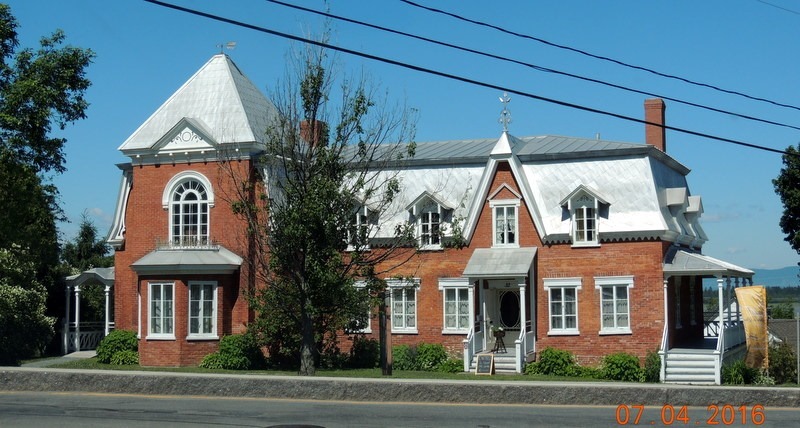 We traveled through a number of small towns, past numerous churches and pretty little houses. We had farmland on the right and the St. Lawrence on the left. The road weaved in and out crossing AR 20 several times. 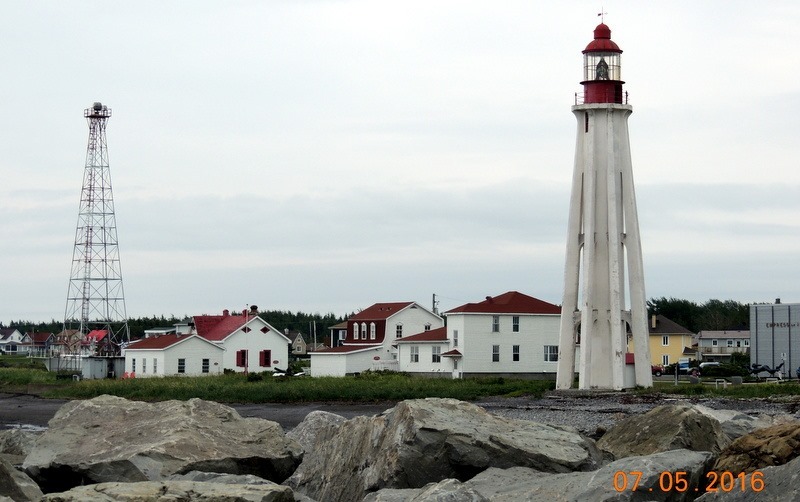 We stopped at a rest area near St.- Jean –Port-Joli, where we could see this lighthouse. This is the Pharesur l’Algernon Rock lighthouse, on an island in the river, 1876. Above is more of the view from the rest area. There were big churches and little churches. 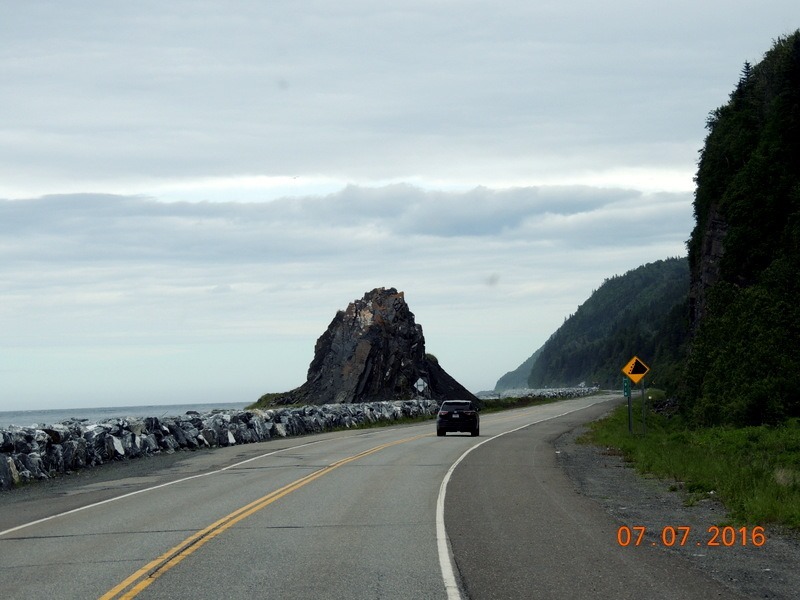 The road was bumpy in some places and very nice in others. Only one stretch was narrow with no shoulders. There was very little traffic, except in the towns. We arrived in Riviere-du-Loup at about 2:30. 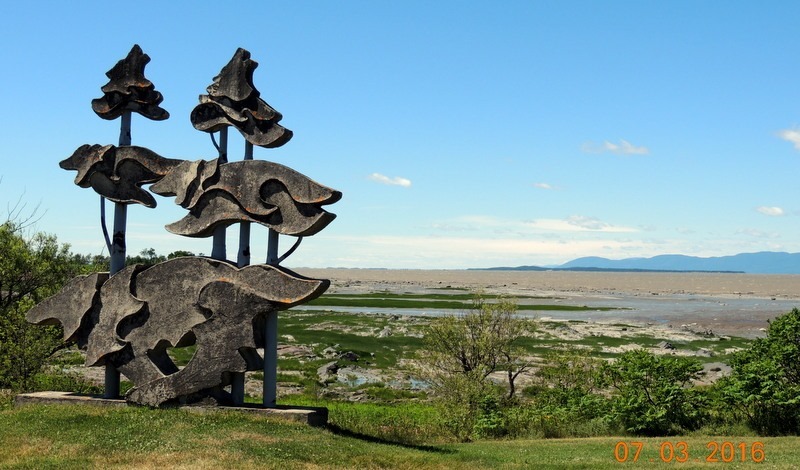 We checked in to Riviere-du-Loup Municipal Park, site 55. $24 per night, U.S., FHU 30 AMP. We could not get satellite due to the trees. 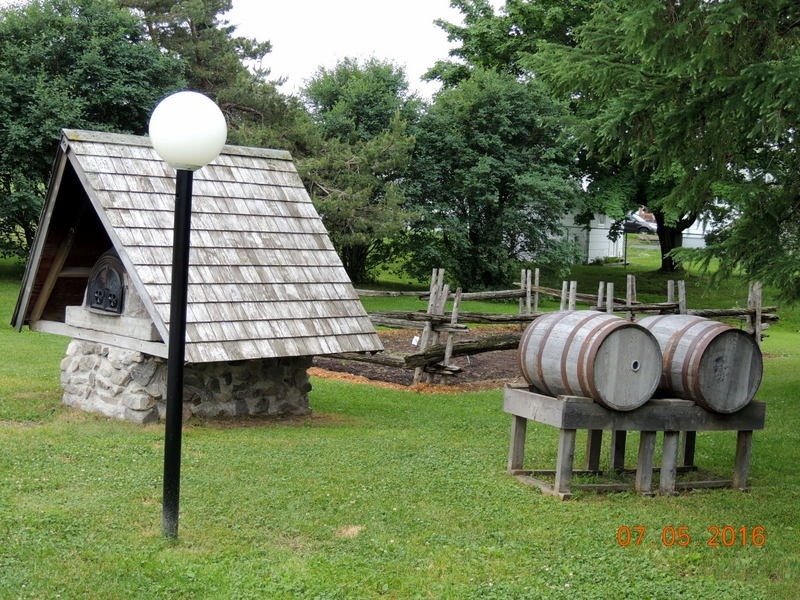 This is a very nice park, with asphalt sites, picnic tables and a fire ring. We had a little trouble getting level, but once we did, we settled in to do laundry and use the free internet. We spent the evening reading and I worked on the blog. Monday- We left around 8:50 and went to the local Visitor Information center. The young man at the counter was very helpful. He pulled out a city map and highlighted the places we were interested in visiting. We stopped at a bakery for a chocolate croissant. 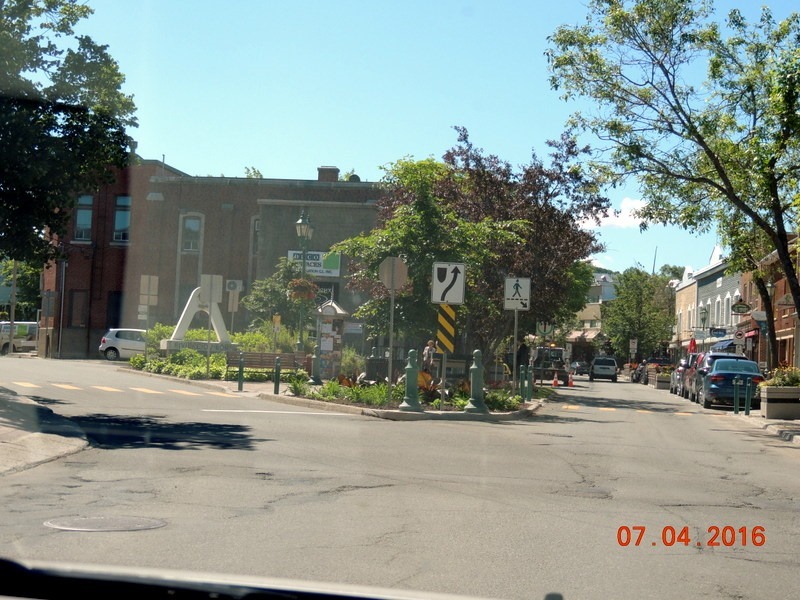 We drove through town and here are some pictures of downtown. We left downtown and stopped at the Christmas store, Noel au Chateau. It reminded me of the Hospice Festival of Trees in Waldorf. Lots of very pretty decorated trees in the shop. We did not pay to go through the tourist trap, which is below. We went out to the ferry where there was a look-out. 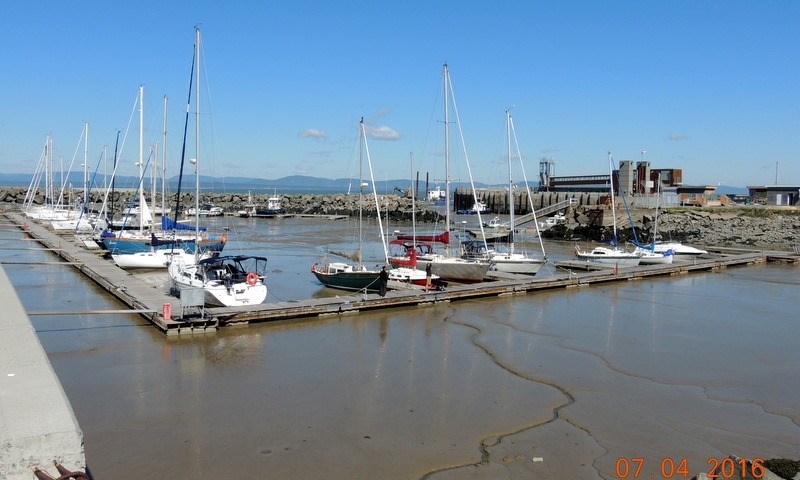 Evidently the tide was out, as the these boats are sitting in mud! 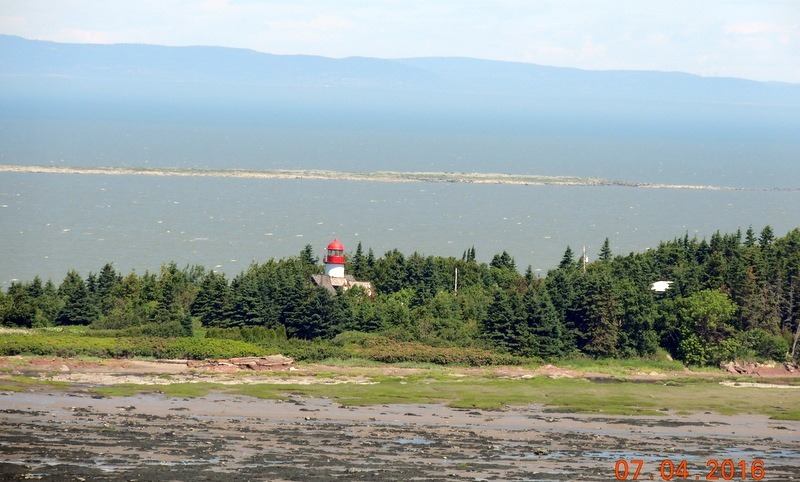 We could see the Pot a L’eau-de-Vie lighthouse on the island across from Riviere-du-Loup. We returned to the MH and retrieved the dogs. We took them with us to Parc des Chutes de Riviere-du-Loup. 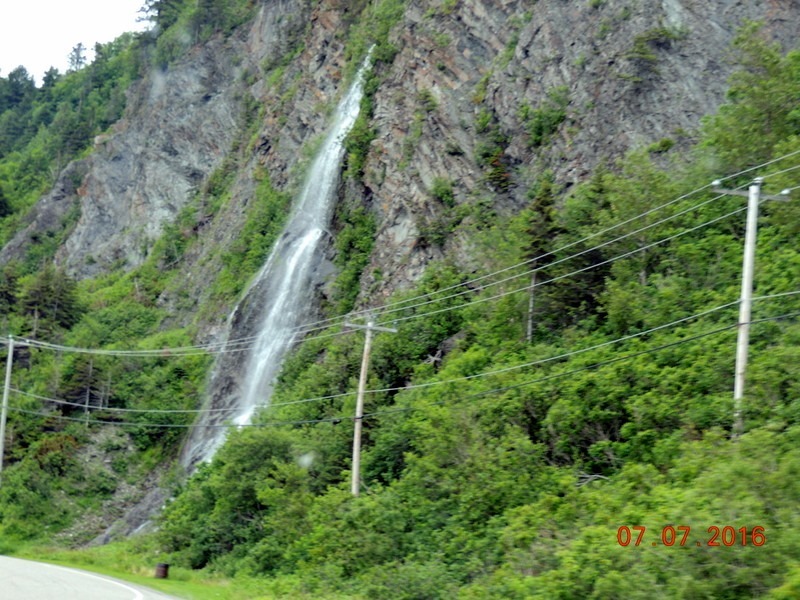 This is a 33 meter waterfall above Riviere-du-Loup. 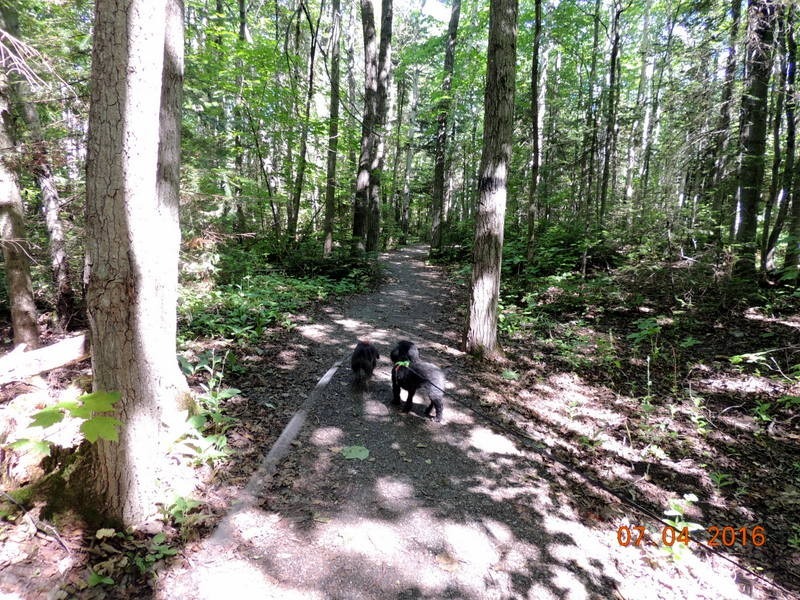 We walked a 960 meter trail with the dogs. 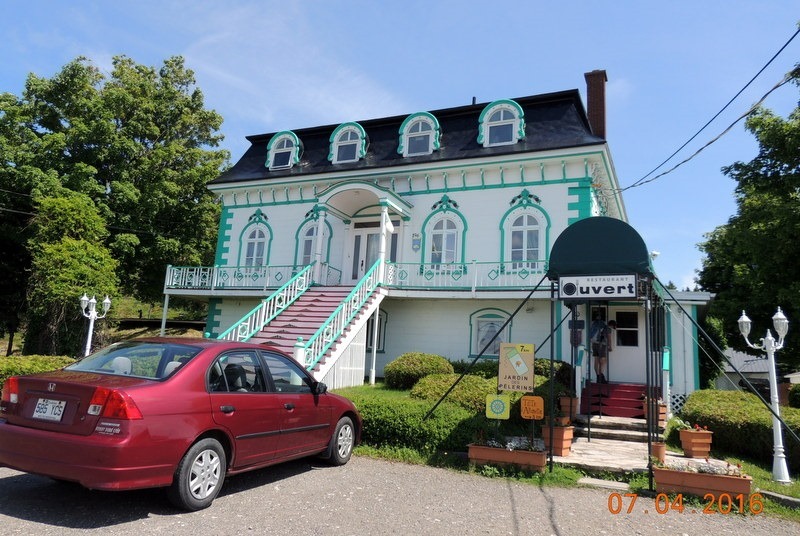 We bypassed Manoir seigneurial Fraser, which is the home of the founding family of Riviere-du-Loup, built in 1830. We did not tour it. We drove up to a viewpoint, back near the RV park, and looked at the river, walking with the dogs out along a boardwalk overlooking the river. We drove along the river where there is a long narrow park with a very nice looking bike trail. 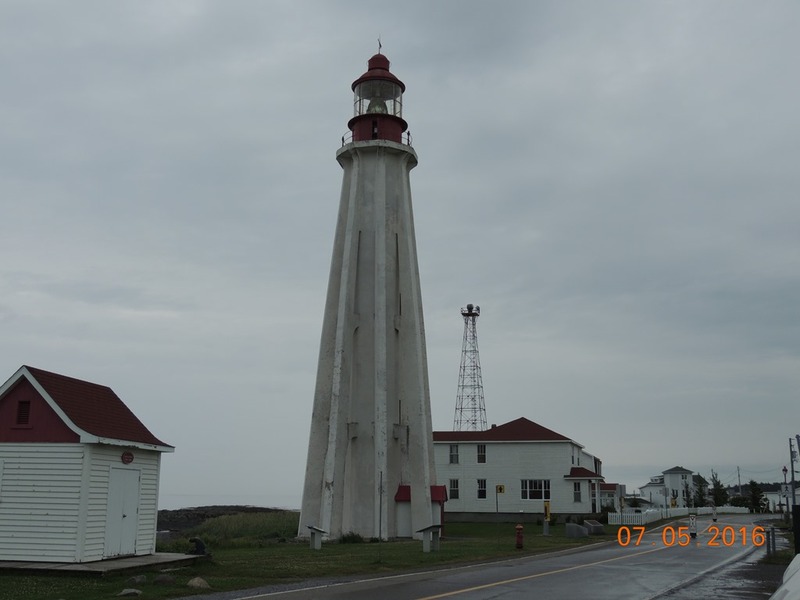 We returned to the MH, dropped off the dogs, and drove south to Notre-Dame-du- Portage. We drove through the scenic little town. We continued south to Sainte-Andre. We drove through and stopped at the Micro-Brewery on the south side. We had seen it yesterday when we drove through and it had been very busy. it was busy enough today, that we had to park in the second parking lot. We walked in and Bob had a sampler of four beers. They only serve appetizers, so we ordered a sausage, . That was all we got! One long sausage that we cut up into pieces. $19 for all. 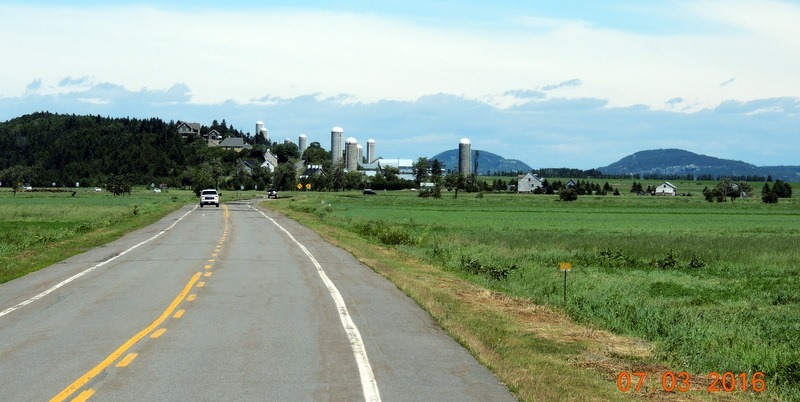 We left and continued south to Kamouraska. 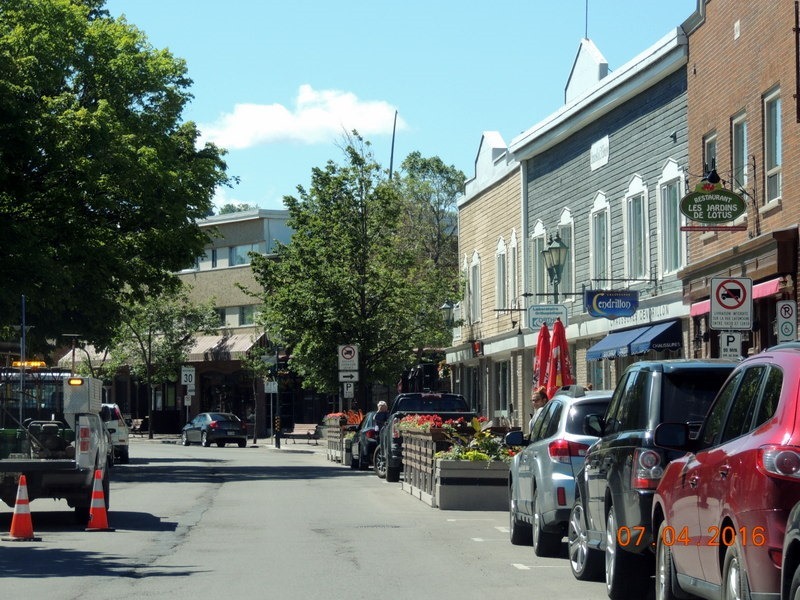 The town had been very busy yesterday when we drove through as there is an art show going on. We stopped in at several restaurants for lunch, but none appealed until we visited a restaurant which called Meme’s which had a lot of cars in the parking lot. Lunch was okay, and not expensive. We saw this pretty hotel on the road. We left and returned north. 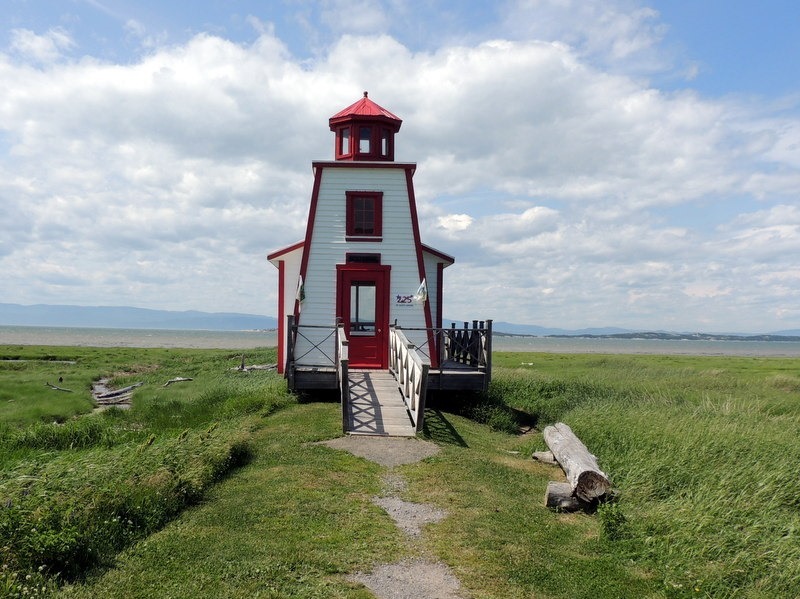 We stopped in Sainte-Andre at the Parc de l’Ancien Quai and saw the pavilion that resembles the decommissioned lighthouse on Long Pelerine, one of the five Iles(islands) that can be seen from the shore. We returned to the MH and started laundry. It is sheets and towels day. Tuesday- Moving day! We drove north on Hwy. 132. It rained while we were traveling. Our designation was Sainte Flavie. At around 1 PM we drove into Captaine Homard RV Park. Homard means lobster. There is a nice little restaurant here. 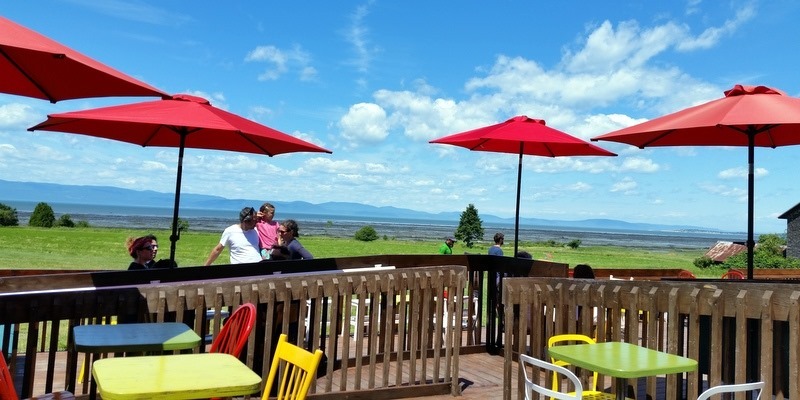 Sainte Flavie is just over the boarder of the Bas-Saint-Laurent region. 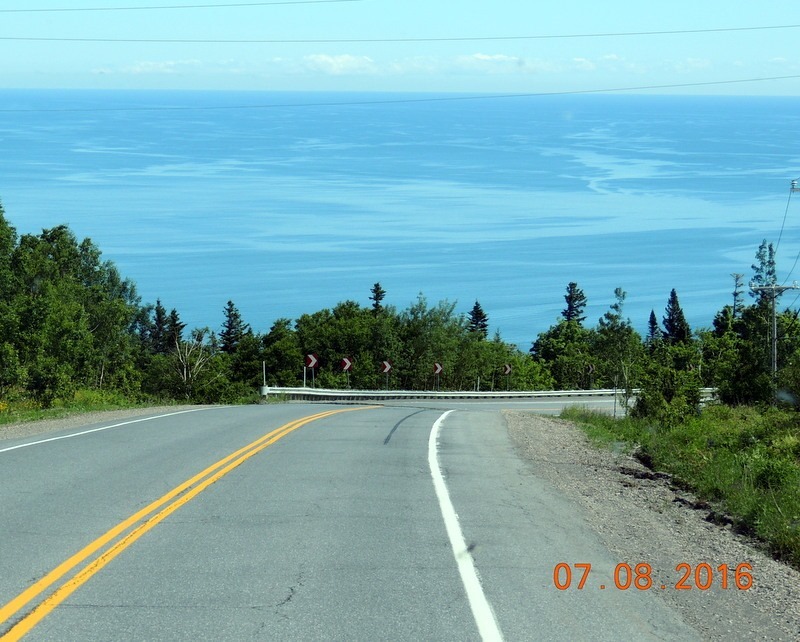 We parked and drove south towards Rimouski. It is a larger town with a Walmart and Canadian Tires. 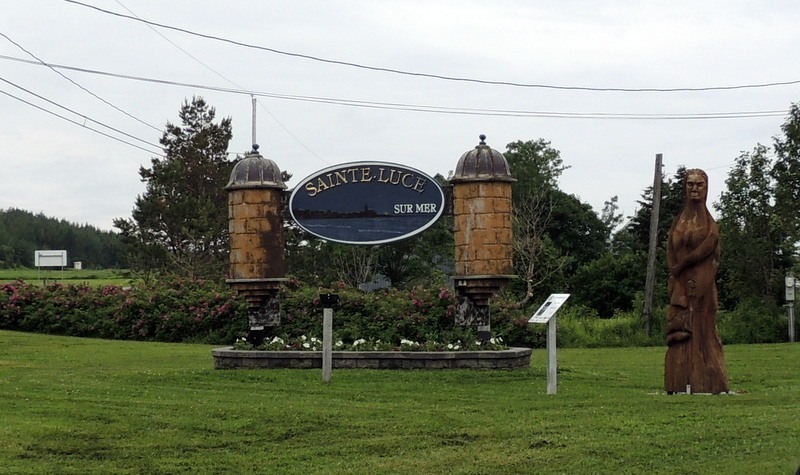 We drove through the little towns on the way, turning out to drive along the St. Lawrence river through areas that we do not drive the MH. 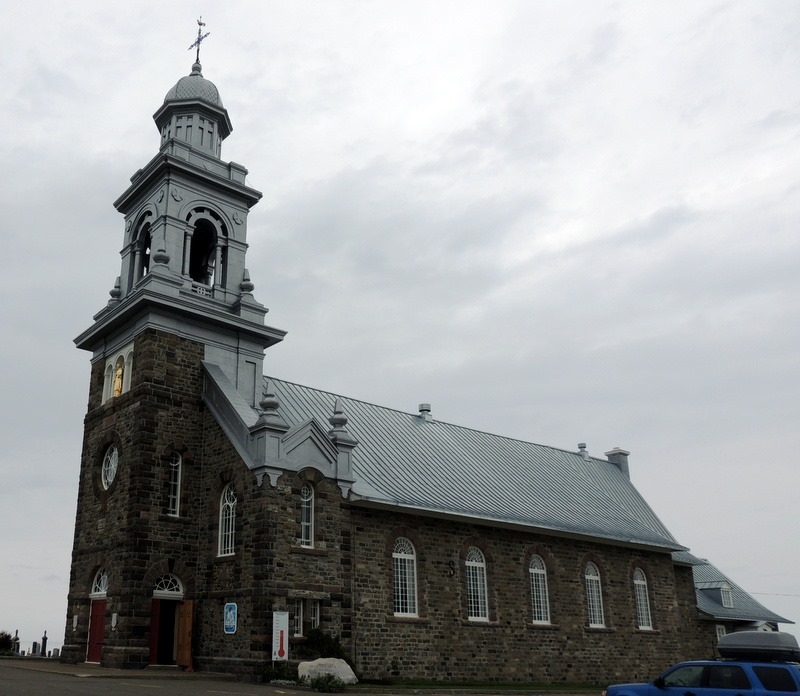 Our first stop was at Sainte Luce, where we looked at this church. 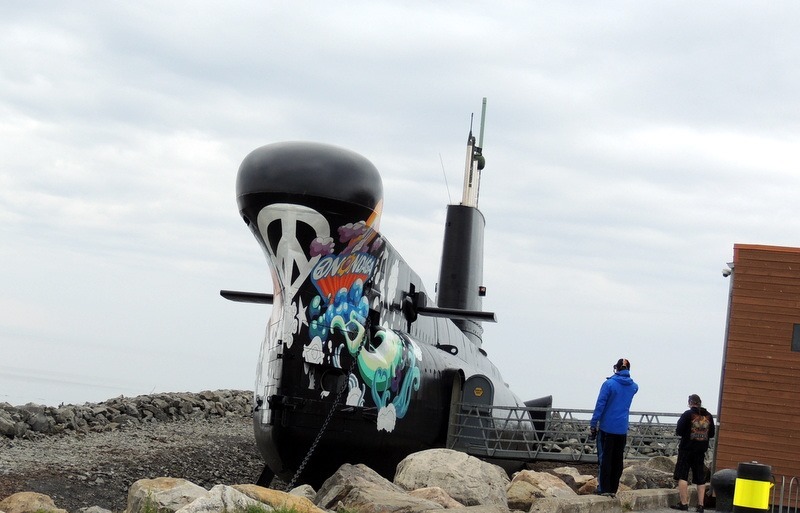 Near the lighthouse was the Historique Maritime de la Pointe-su- Pere maritime museum. 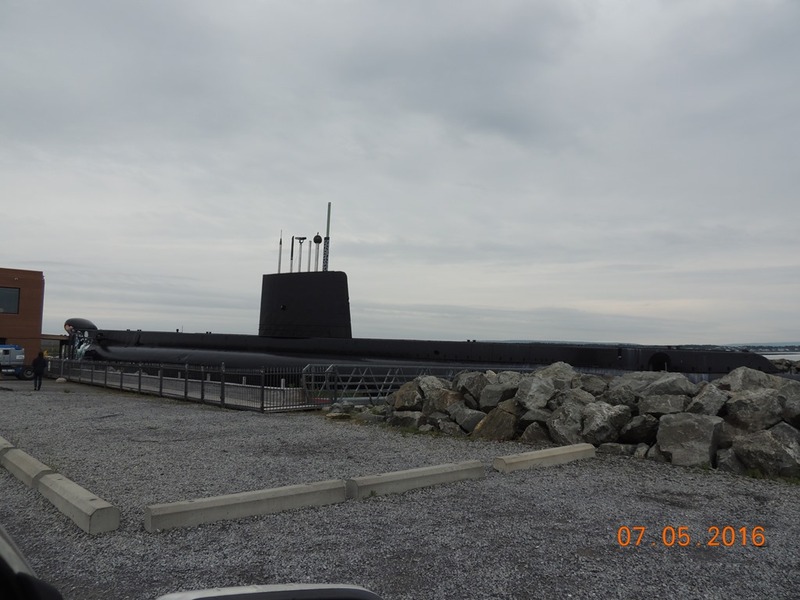 Outside was the Sous-marin Onondaga, a submarine which had a crew of 70. 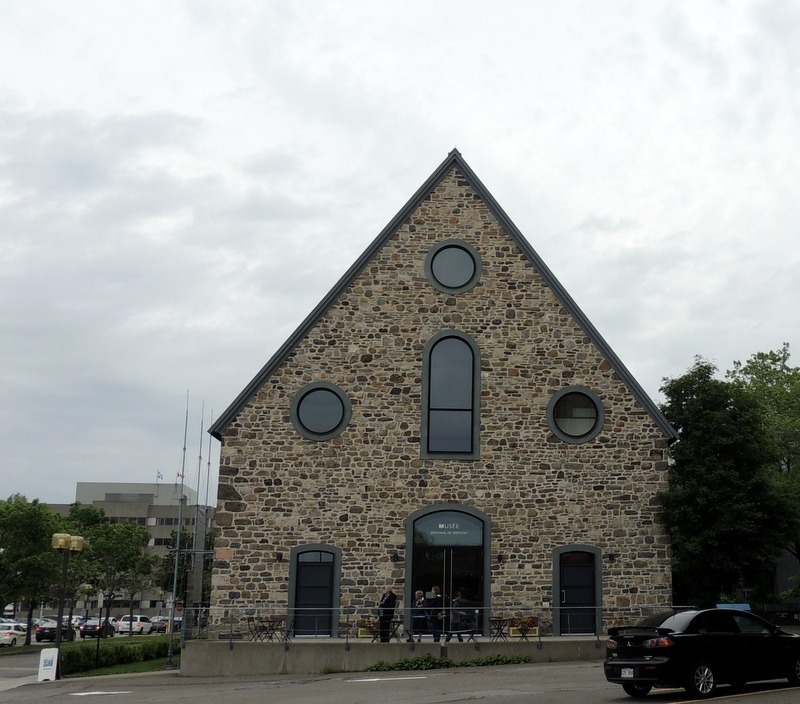 On our way downtown, we passed the Site Historique de la Maison Lamontagne. 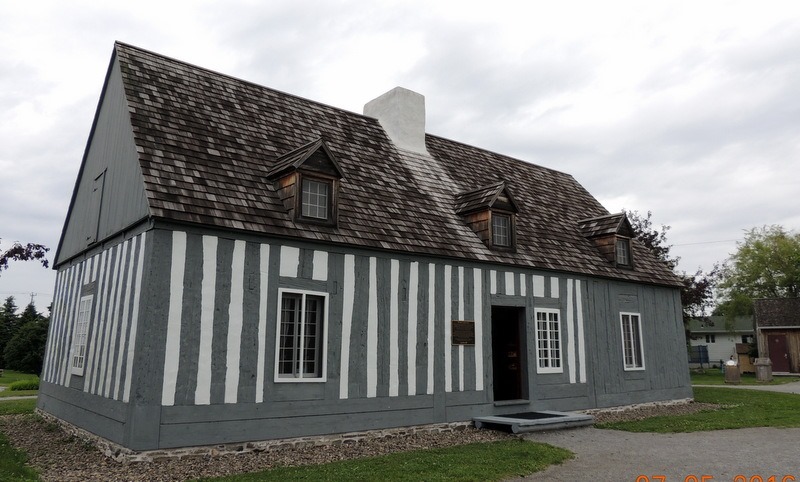 This home was built around 1744 and is the oldest house in eastern Quebec. 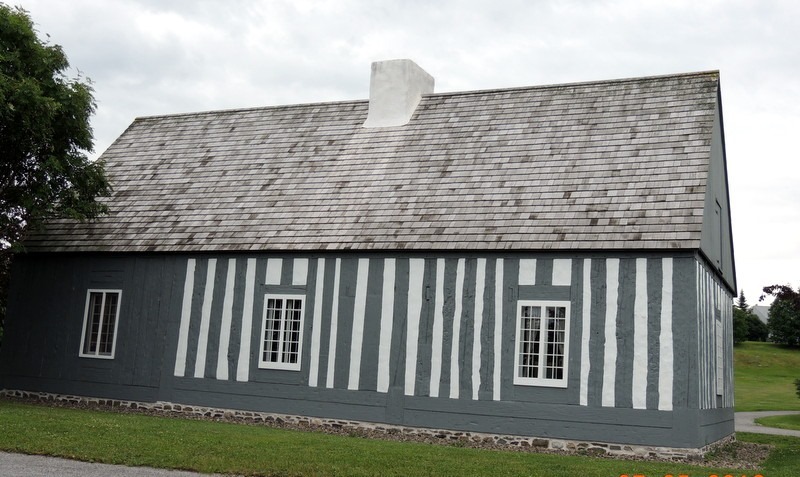 It is a rare example of a half-timber framing with stone infilling in North America. Above is the oven, which is outside the house. 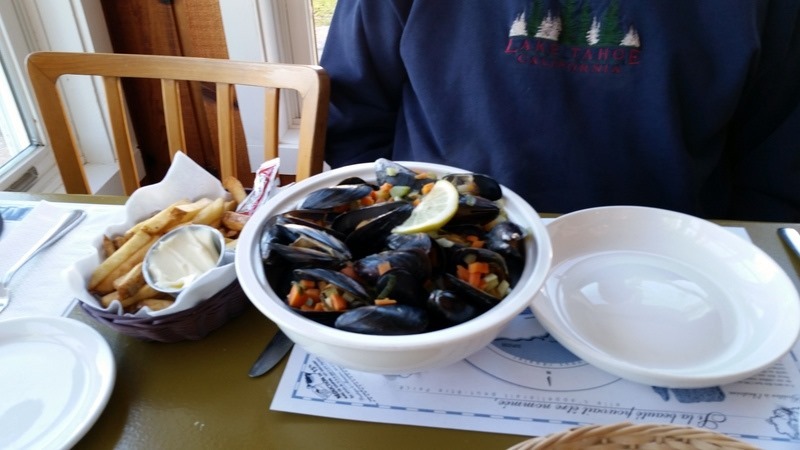 Can you imagine going outside to cook in the winter, right near the St. Lawrence river, with how cold it must have been! Then we continued downtown to the Visitor Center. The lady spoke English poorly, but we made it through. She marked a few places to visit. The town is very pretty with a boardwalk along the river for walking, running and biking. 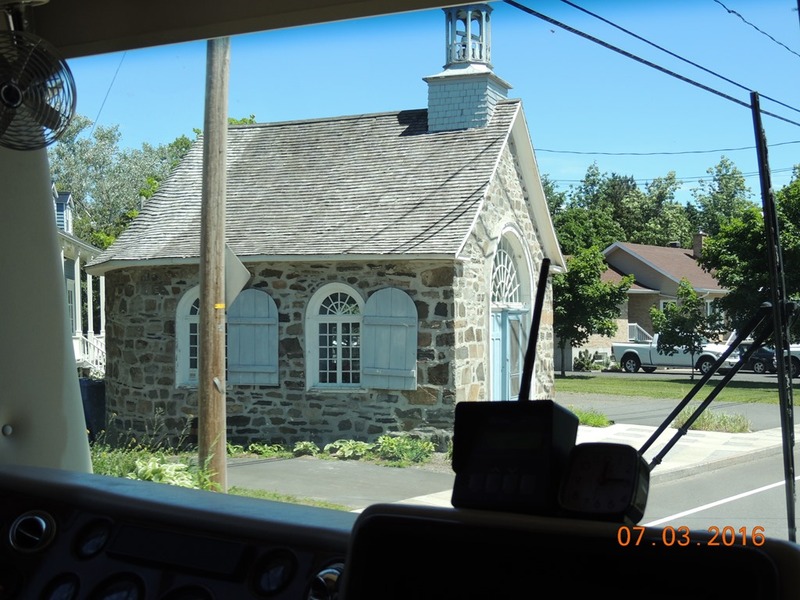 We looked at the first stone church built in east Quebec. It is now a museum. 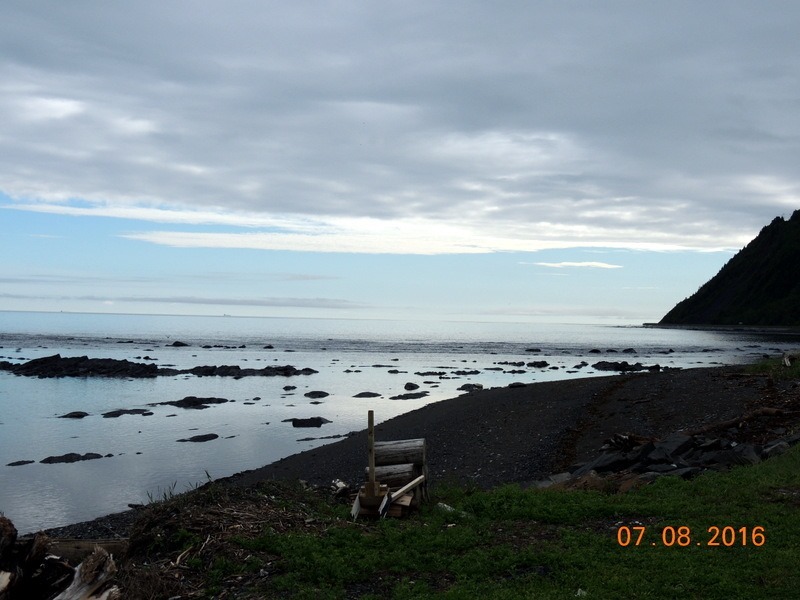 We returned to the MH, walked the dogs,and went to dinner at Captaine Homards. I had a lobster salad $25, and Bob had a 1 lb. lobster, with salad, $19. We walked back to the MH, watched some TV and went to bed. Wednesday- We drove back farther south to Trois Pistoles. We stopped at the visitor center and went to the Fromagerie des Basques. Fromage is cheese. We sampled 4 cheeses, one was BBQ cheese curds. They were chewy, then a beer cheese, which was sharp and a brie which was also sharp. 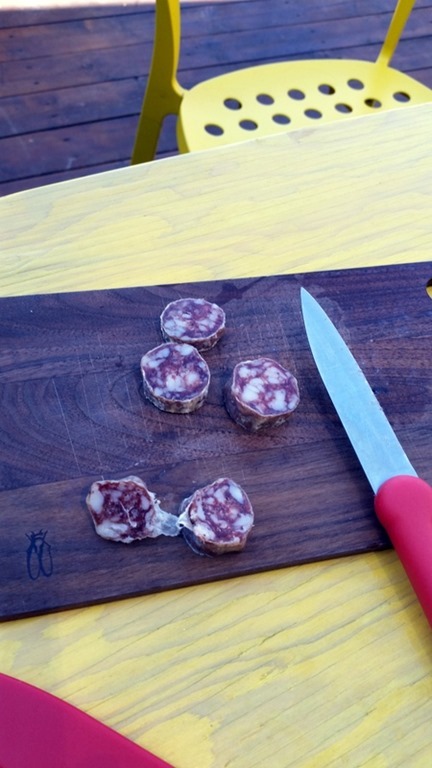 We tried the Swiss, and it was very good! We did not buy any though. 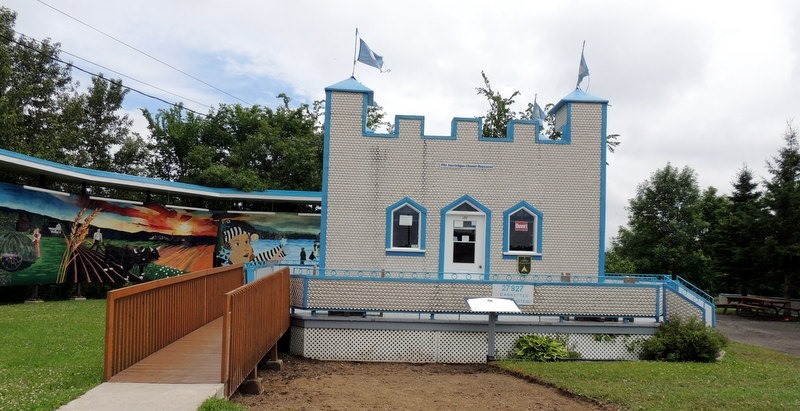 We left and went to see a building built out of aluminum cans to the southwest in Sainte-Jean-Dieu. this building and tourist information center was built of 27,927 aluminum cans. 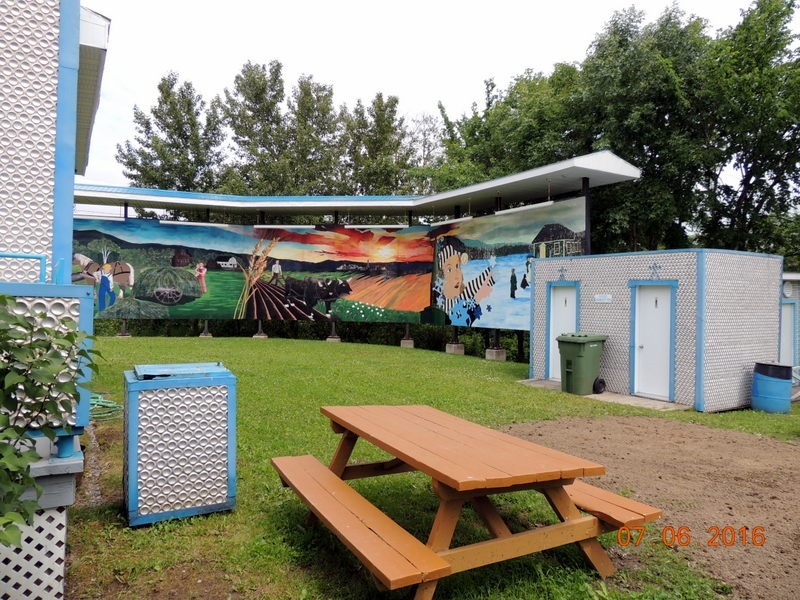 It is surrounded by murals. 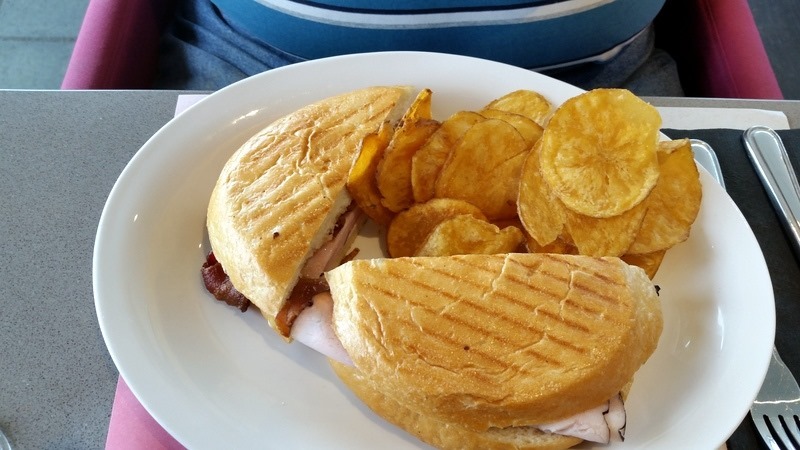 We returned to Trois Pisoles and went to lunch at Kwik Kwik, the fromagerie restaurant. They did not speak Engllish and the menu was in French. We managed though. Bob had a Croque Monsieur ( a French ham and cheese, but much better than an American ham and cheese due to the cheese, ham and bread). 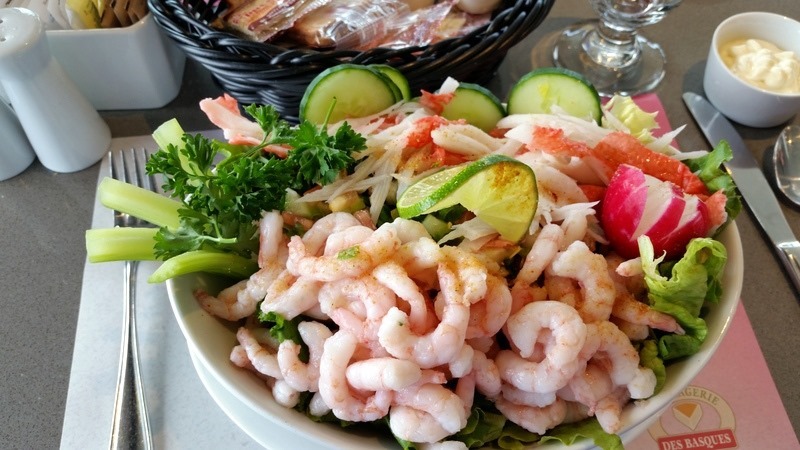 I had the ‘salade marine’, which was a shrimp and crab salad. On the way back, we stopped in Sainte Fabien to visit the Musee de la grange Octogonale. 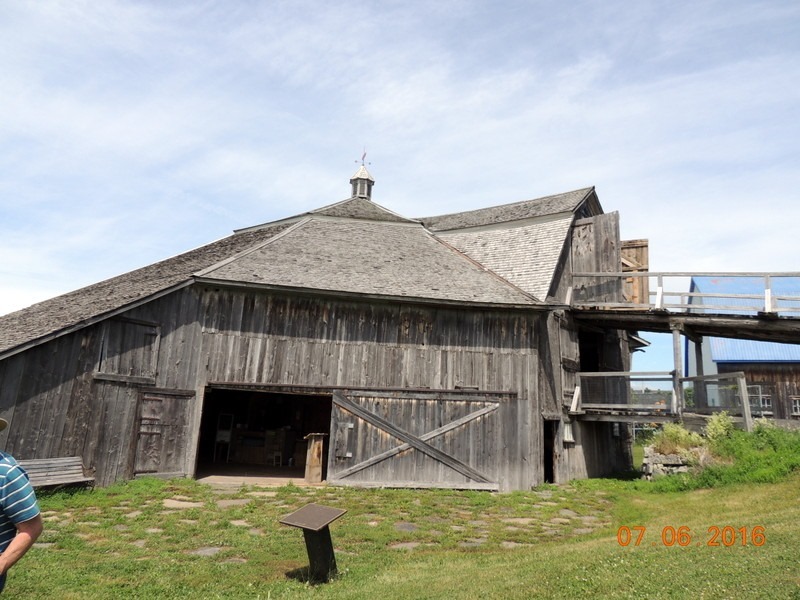 This is a four story, octagonal barn, the only one in Quebec. It was built in 1888 by d’Adolphe Gagnon. I have Gagnon’s in my family tree, so this may have been a relative. We returned to Rimouski and purchased gas($ 1.08 per litre, $3.24 gal.) and went through a car wash ( $ 9.00). Then it was back home to the MH at Captaine Homards. 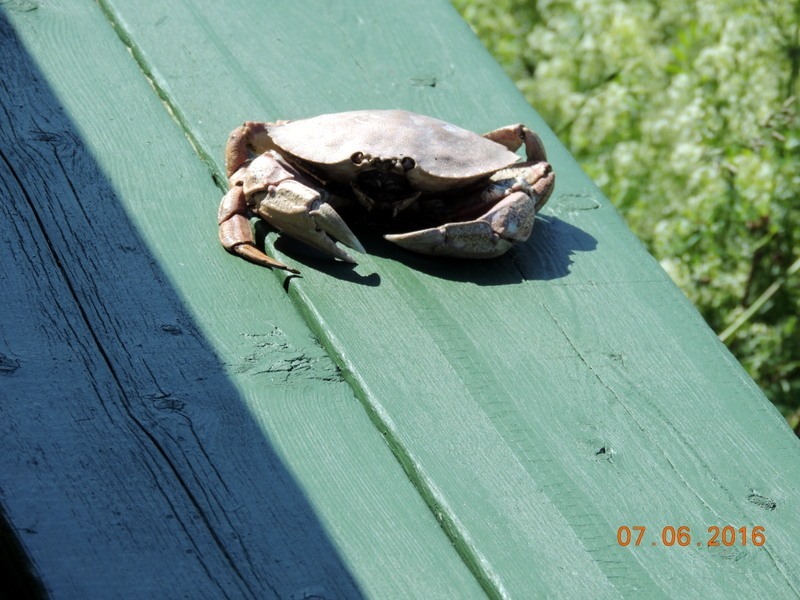 When we arrived, we found this little fellow on our picnic table. Not sure who put him there! We ate dinner in, and settled in to watch TV and go to bed. Thursday- Moving Day. We continued north on Hwy 132. 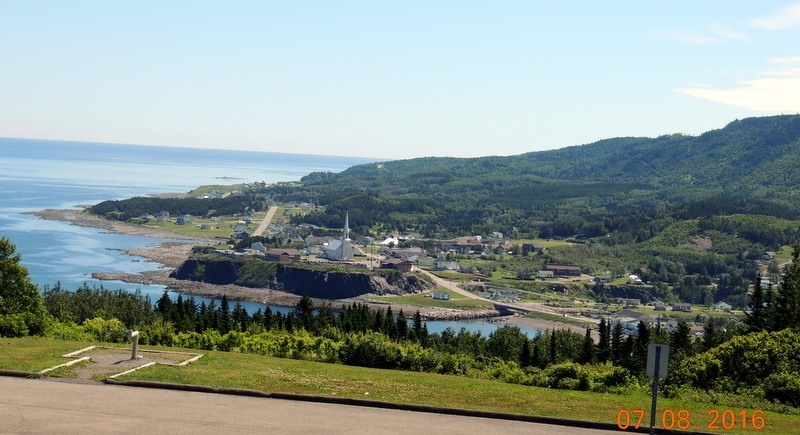 We are now in the Gaspe Region, on the Gaspe Peninsula. We ended the “Route of the Navigators” which is what Hay 132 has been called up until this point. 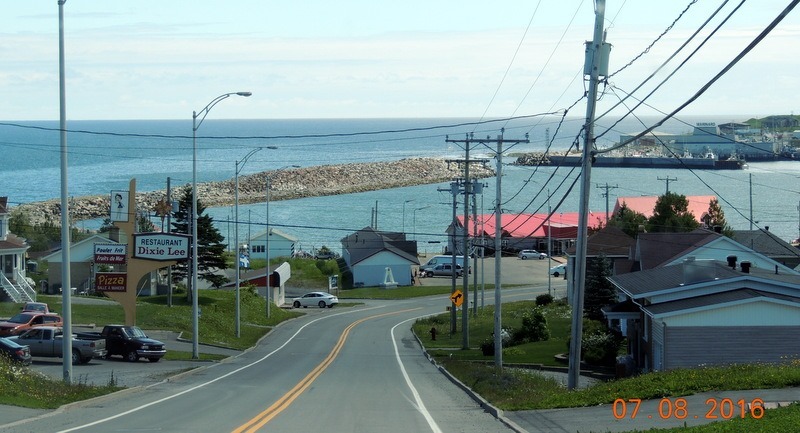 We continued north east to Matane where we stopped in the Walmart parking lot. 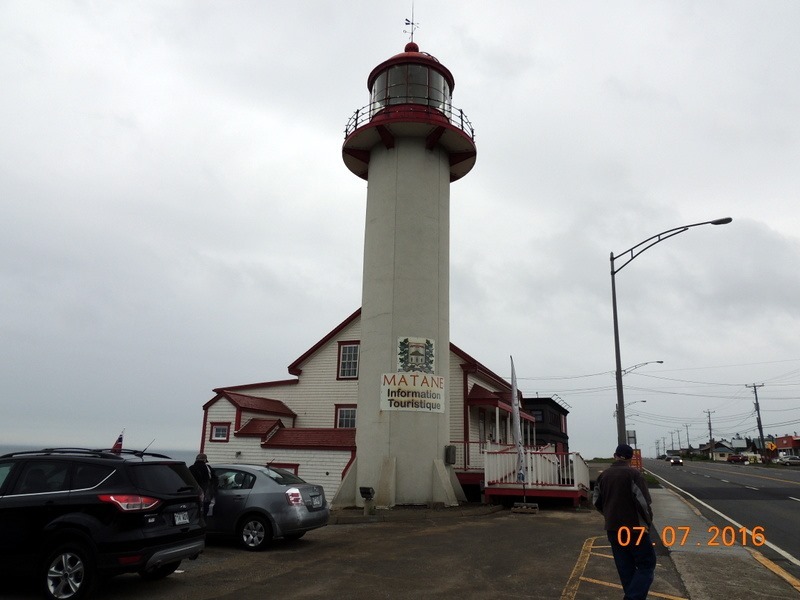 We disconnected the car and went to look at the Matane Lighthouse, 1865 to 1937. We stopped in at the Canadian Tire for Bob to purchase some oil for the MH engine. We re-hooked up the car, between rain drops, and ate lunch. We continued northeast on Hwy 132. The peninsula is divided into areas. 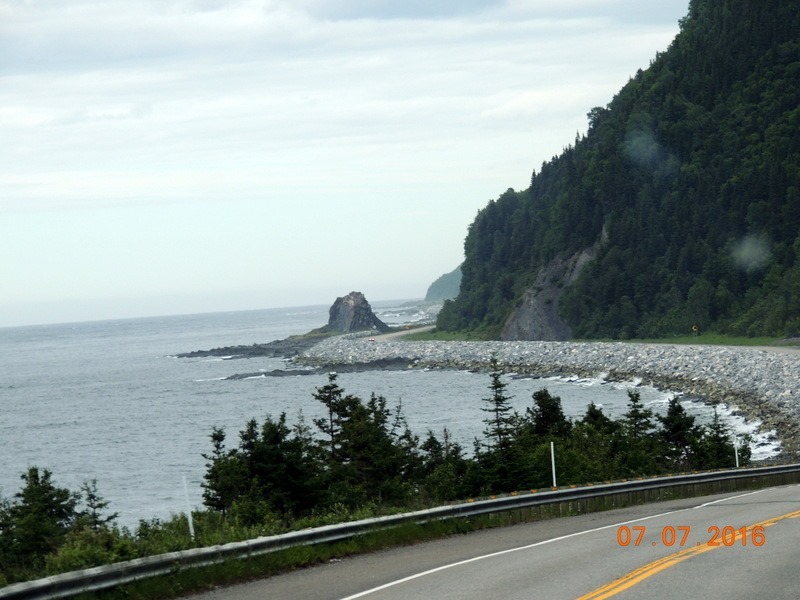 The first area is The Coast, and we sure saw a lot of beautiful scenery. 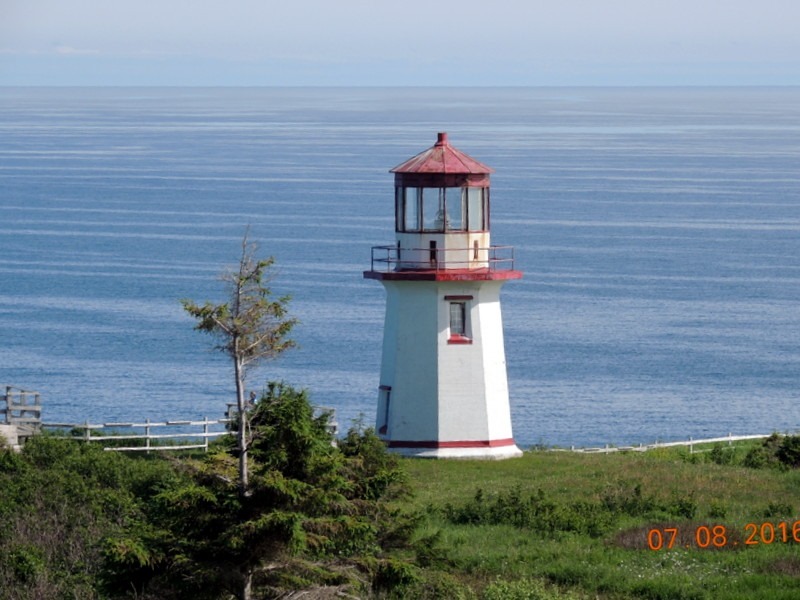 The other areas are “The Haute-Gaspesie”, Lands End, The Bay and the Valley. The farther northeast that we drove, the more water we saw. We passed through scenic little towns. 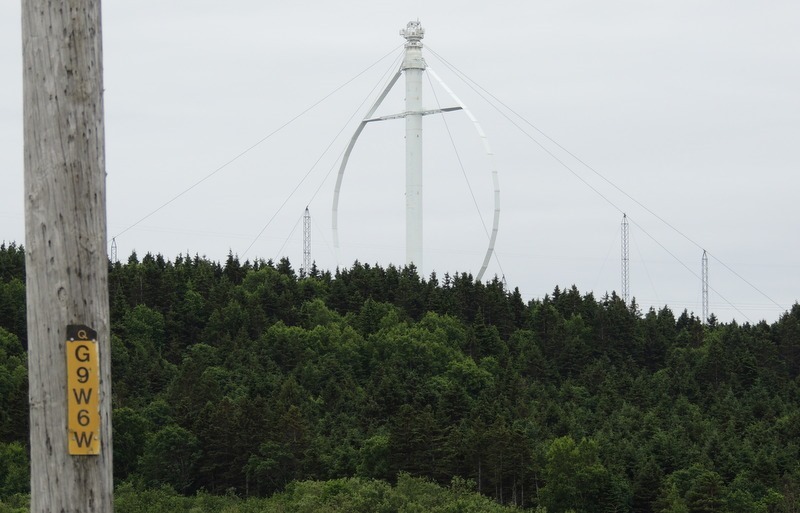 We missed one lighthouse, in Cap-Chat, but were able to see the worlds largest windmill and the light house in La Martre, which was right off the highway. 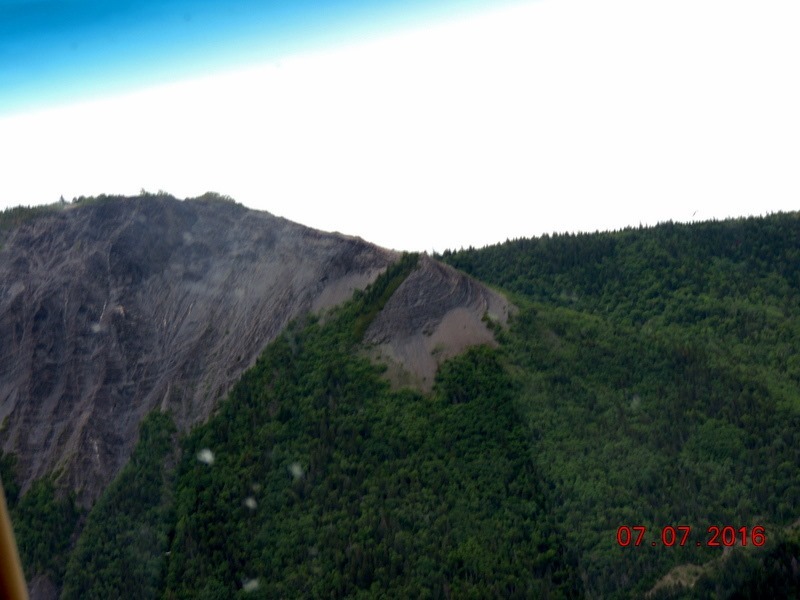 We continued to Parc de la Mert in Sainte-Maxine-du Mont-Louis( we are in the Haute-Gaspesie area). We parked in a 50 amp FHU, $37 can. I immediately started to do laundry, as we could not do laundry at Captaine Homards,because the sewer connection was too high, so the water would not run down into the sewer. I did 5 loads of laundry. I don’t dry items, so we had them hanging all over the M H.
We ate dinner at home, watched TV and went to bed. We are still getting Direct TV this far north. We are amazed! Originally, we planned to stay 2 nights, but decided to only stay one night, as there is not much to see in this area. Friday- Moving day! This was my view on my walk! We are going to have a nice sunny day today, but we are still wearing jeans and sweatshirts. We left around 9:45 driving northeast on Hwy 132. We drove through little towns and through mountains. We have now moved into the Lands End area. 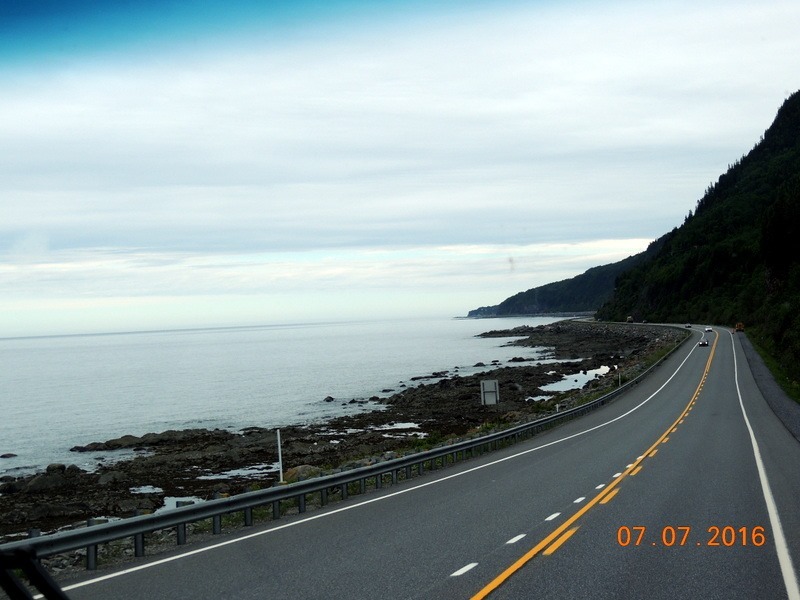 We had to drive very slowly due to the curves and the 14% grades. We stopped at this rest area overlooking Grand Valle. So beautiful! 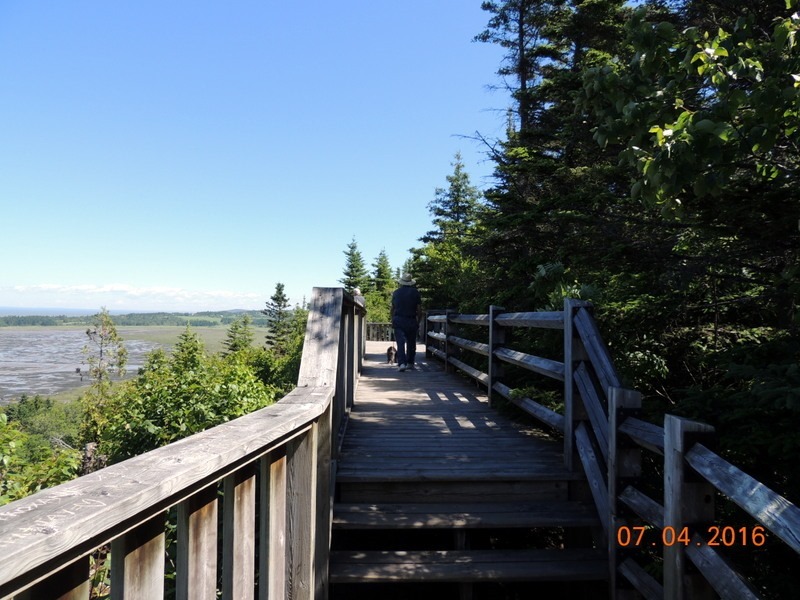 We stopped at the visitor center in Parc National Forillon and ate lunch then went in for the map and information on the park. 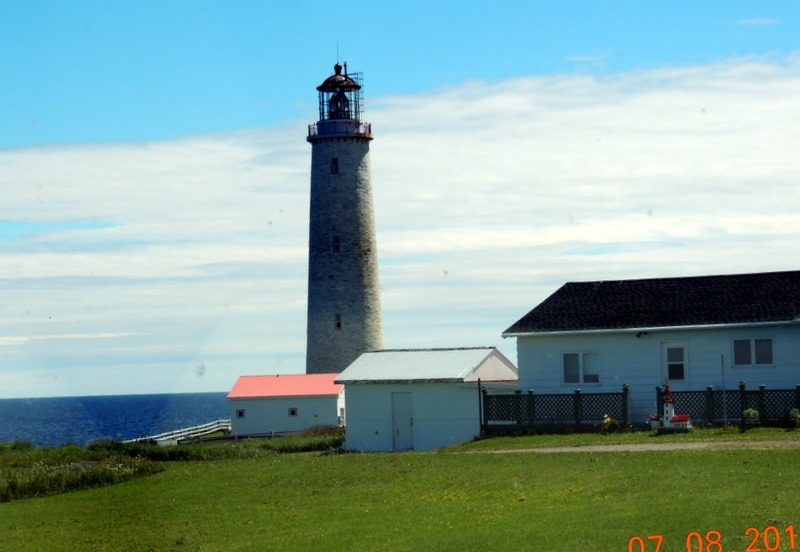 We continued past the Cap-des-Rosiers lighthouse, which is in the park. 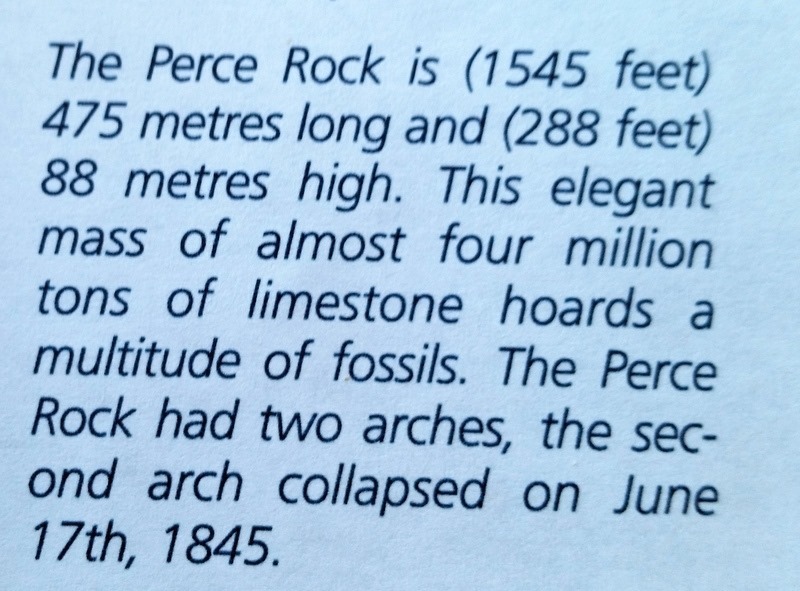 We continued on to Perce, our destination. 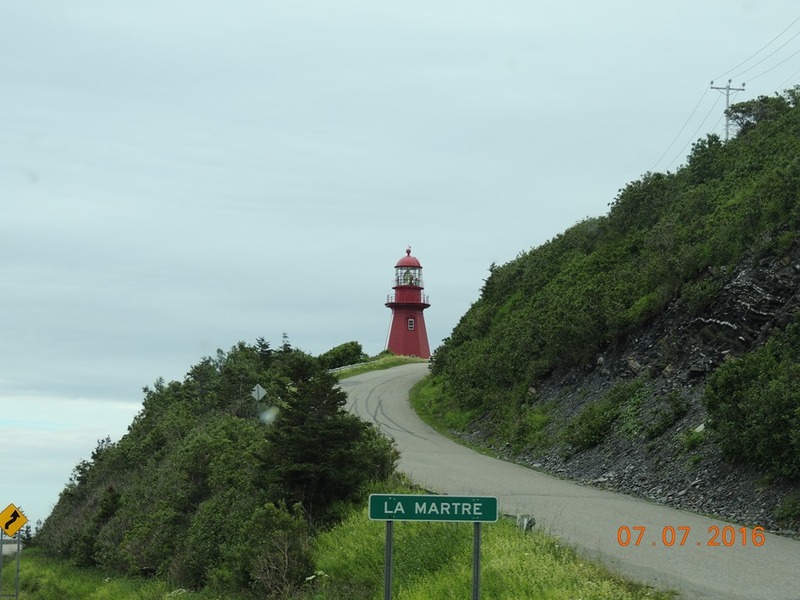 We drove into Camping du Phare a Perce at about 2:30. This is a PA park, $ 23 C for FHU 50 amp. We are staying 3 nights. 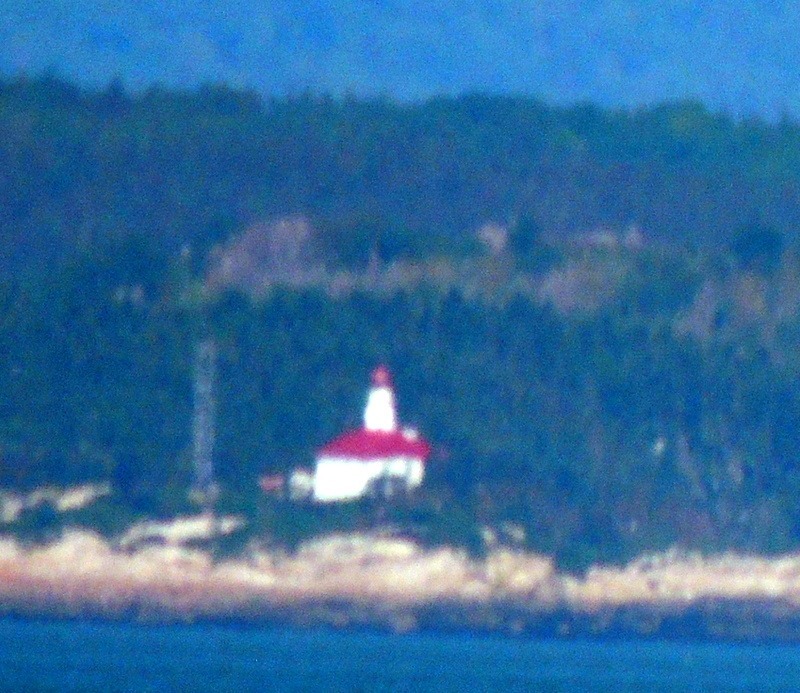 and the lighthouse from the park. We settled in and were able to take off our sweatshirts as it was sunny and warmer, low 60’s. Eventually we went to dinner at Baird Restaurant. I had stopped at the office and asked Denise, the owner, what was a good restaurant. She said BR and waved on the right. Her English is minimal. So we drove through town looking for BR, but figured out this was the restaurant. They had an all you can eat bar for $32.50, but we ate off the menu. Bob had the muscles which came with carrots and celery in the broth and I had the scallops in an scallion wine sauce. They were delicious. We returned to the MH. We are still receiving Direct TV! We did not think we could be able to get the TV the entire trip! We have noticed that the farther northeast that we travel, the less English is spoken. This has not been an issue for us, as we are able to cope with the language difference. It is fun to communicate!